The World Athletics Championships may be coming to an end in Daegu this weekend, but 90 kilometers down the Gyeongbu Expressway, two of the nation’s biggest track stars will face off in the Group 3 Busan Owners’ Trophy. Dangdae Bulpae has been the stand-out Stakes winning star of the past year with five Stakes victories including the Minister’s and Ttukseom Cups at Seoul. He’ll go into Sunday’s race as hot favourite but will face the two horses that finished ahead of him in last year’s Korean Derby, Cheonnyeon Daero and Triple Sinhwa. 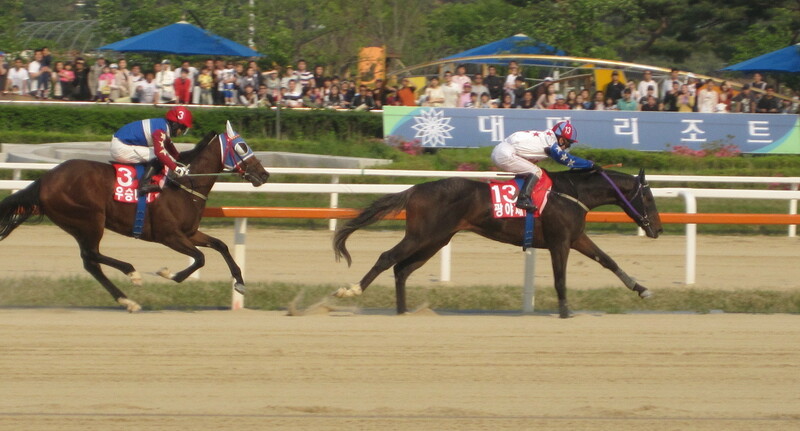 In his last outing, in the Busan Metropolitan in July, Dangdae Bulpae got suckered into a speed duel with favourite Tough Win which left both horses exhausted and out of contention in the home straight. Jockey Jo SUng Gon will be under pressure not to allow that to happen again. Coincidentally, Cheonnyeon Daero benefitted in his Derby by favourite on the day Money Car suffering exactly the same fate as he took on sprint king Seonbongbulpae in the early stages of the race and wilted close to the line. Cheonnyeon Daero took the win and his gone on to become a top performer. However, he was second to Dangdae Bulpae in both the Ttukseom Cup and KNN Cup and few would bet against the same happening again. Toshio Uchida’s second stint in Korea ended in typical fashion as the Japanese jockey landed a pair of victories at Busan Race Park this afternoon. Uchida’s short-term Korean license expires on August 31 and the Korea Racing Authority (KRA) have decided not to renew it. 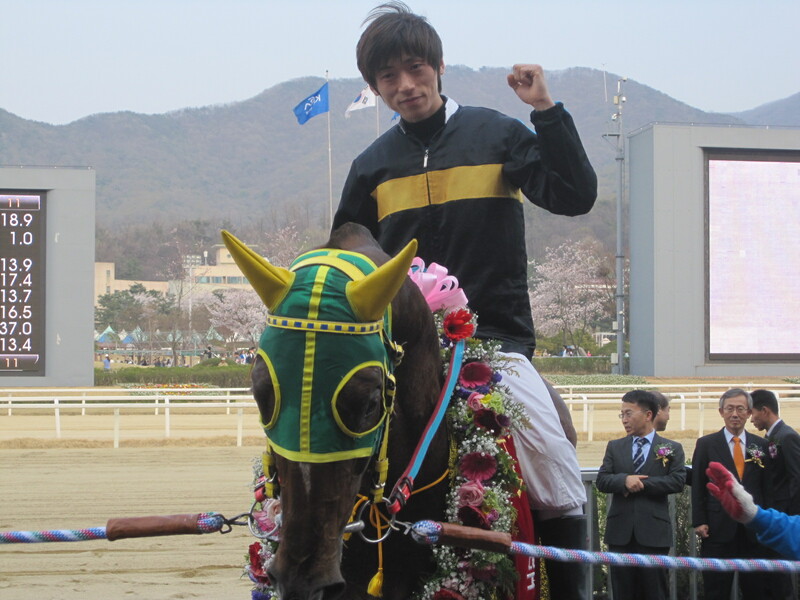 Uchida, who will be 50 in October, is currently top of the 2011 Jockey Championship at Busan and since returning to Korea last autumn has ridden 69 winners from 384 mounts. It could be argued that he is the most popular Japanese man in Korea. Taking together his two spells, Uchida rode 138 winners from 695 rides – a winning rate of 19.9%. His quinella strike rate was 32.8% and his place rate 46.3%. His biggest win came in this year’s KRA Cup Mile, the first leg of the Korean Triple Crown on Soseuldaemun (Meisei Opera). So why not renew his license? In a statement, the KRA noted that racing fans here would be very disappointed with the decision. That is an understatement. “Mr. 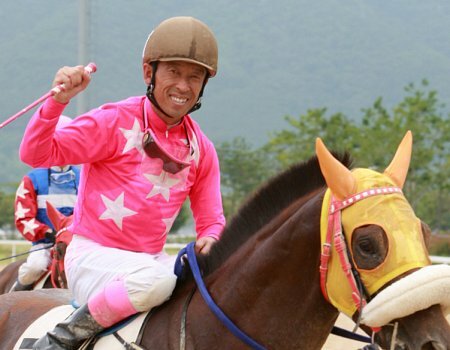 Pink” is so popular that when he made a rare appearance at Seoul, punters chanted his name and applauded him around the paddock – something absolutely unheard of in Korean racing. Going on to explain, the KRA restated that the goal of their foreign jockey program was to expose local riders to a variety of different styles in the hope that it would be beneficial to them. With Uchida having been in Korea for a total of nearly two years and another Japanese rider Akane Yamamoto having just starting at the track, it was felt that the time was right to move in a different direction – indeed, Uchida’s replacement will be Australian Nathan Stanley. So it is today. It’s understandable, as their job is to protect themselves, but the local Jockey Union is extremely hostile to the idea of foreign riders coming across and “taking their money.” And Uchida certainly took a lot of it! However, this creates conditions that are very difficult for all but the thickest skinned rider to thrive in. Japanese jockeys have had the most success – the only non-Japanese to make a serious go of it have been Baker and South Africa’s Martin Wepner (who had his own license not renewed at the very last-minute) – perhaps due to the cultural aspects of a jockey’s job being similar. Given these barriers, it’s difficult to imagine what the KRA expects of a foreign jockey – be inspiring, but don’t win? Uchida’s two wins today were both in his usual fashion. 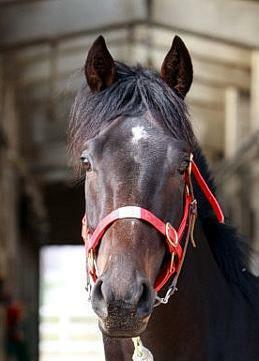 First up was Sarang Dream [Purge-Hurricane Warning] in race 3. What Uchida has which is rare among Korean jockeys is the ability to judge the pace of a race and this was apparent here as he manoeuvered Sarang Dream into position and then asked the colt for an effort at exactly the right time, not even needing to use his whip. Next was New Zealand bred Dangdae Champ [Falkirk-Soaring] who Uchida saw to a two-length victory in race 4. In his final race in Korea, there was every chance of Uchida completing a hat-trick. However, after being sent off second-favourite in the second of co-feature races, Trademark [War Zone-Devil’s Dervish] had to be pulled up after suffering an injury. 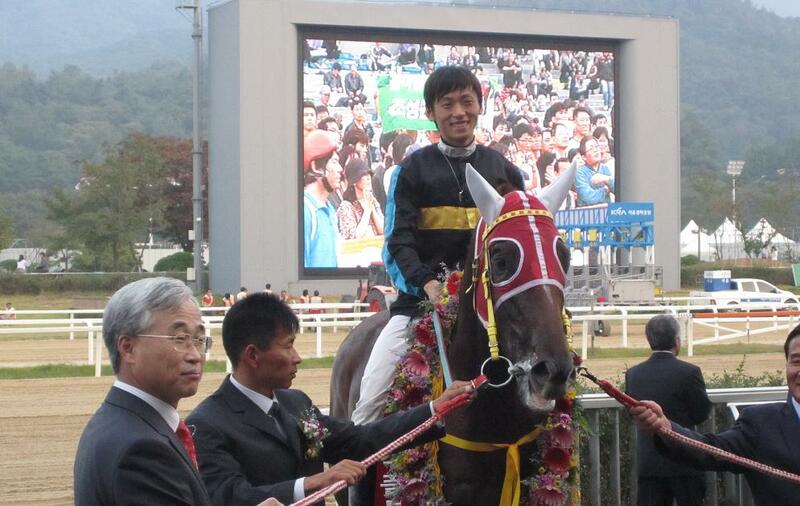 That race was won by Winning Perfect [Doyen-Miss Beauty] ridden by Jo Sung Gon. Jo is one of the nation’s most promising jockeys and one of those who stood to gain the most from competing with Uchida. The reality is that only tuition from the likes of Kenny Michel, the excellent South African Jockey trainer who has been working in Korea for the past three years and is turning out some very impressive apprentices, can improve the technical ability of Korean riders. Uchida’s role was to take them out of their comfort zone. Next Friday, Jo Sung Gon is going to be very much back in his comfort zone. * In other races at Busan, there was an eighth win in eight starts for three-year old US import Lion Santa [Lion Hearted-Santa Fe Strip]. Jockey Kim DOng Young left it until the very last moment but Lion Santa was far too good for a field that included 2008 Korean Derby winner Ebony Storm. Up at Seoul, former Champion Filly and Mare Dongbang Rose [Volponi-Night Mary] returned to form in impressive style, taking the feature handicap. With three of the four three-year old Classics out-of-the-way, last year’s Leading General Sire in Korea Creek Cat holds a narrow lead at the top of this year’s race. Fellow established sire Exploit is just behind him but then come the newcomers Menifee and Vicar, who each have a Classic winner to their name this year in third and fourth. With the top four separated by less than the value of a big Stakes win, there’s all to play for as we head into the autumn. Gwangyajeil won the Derby for Vicar while Useung Touch, second in that race, won last week’s Oaks to put Menifee up into third spot. With the KRA Cup Mile having gone to Soseuldaemun by the relatively unknown Japanese bred sire Meisei Opera, it is Yeonseung Daero’s exploits in winning the Busan Metropolitan that gives Creek Cat his lead. In terms of wins to starts, Vicar and Menifee are far and away superior to their more established counterparts – helped of course by having fewer starters – with figures of 23% and 18% respectively. US bred sires still dominate with Japan’s Biwa Shinseiki, sire of multiple Stakes winner Dangdae Bulpae, the only non-American in the top ten. He is followed by Ireland’s Yehudi in eleventh who is having a successful second crop. With Menifee and Vicar looking set to be successful and with high expectations of new arrivals Ecton Park and Forest Camp – not to mention Officer – who will all be coming online on the next couple of years, things are looking up in terms of Korean breeding. 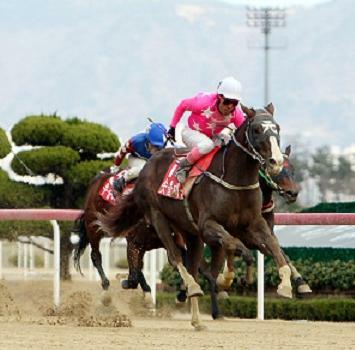 She was second in the Derby and today, at Busan Race Park, Useung Touch went one better to win the 2011 Korean Oaks in dominating fashion. Sent off at slightly better than evens, but starting right on the outside in gate 14, jockey Choi Si Dae sent Useung Touch out quickly and straight into an early lead. Challengers came and went, most noticeably Sen Girl in the back straight but, despite Choi having to battle for a time in the stretch to keep Useung Touch straight, it was clear the rest were only ever racing for second. 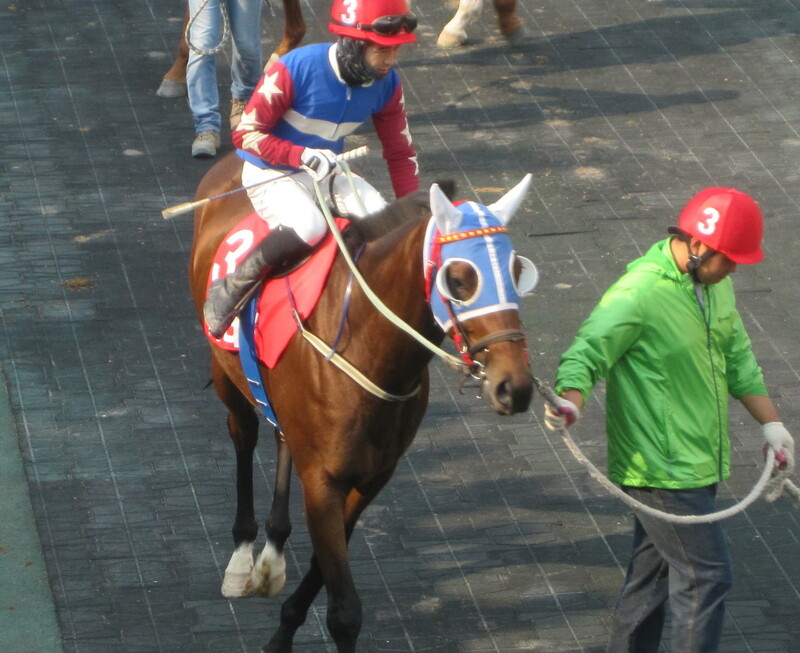 In the end it was second-favourite Amass who got closest to the winner meaning a one-two finish for Busan fillies. 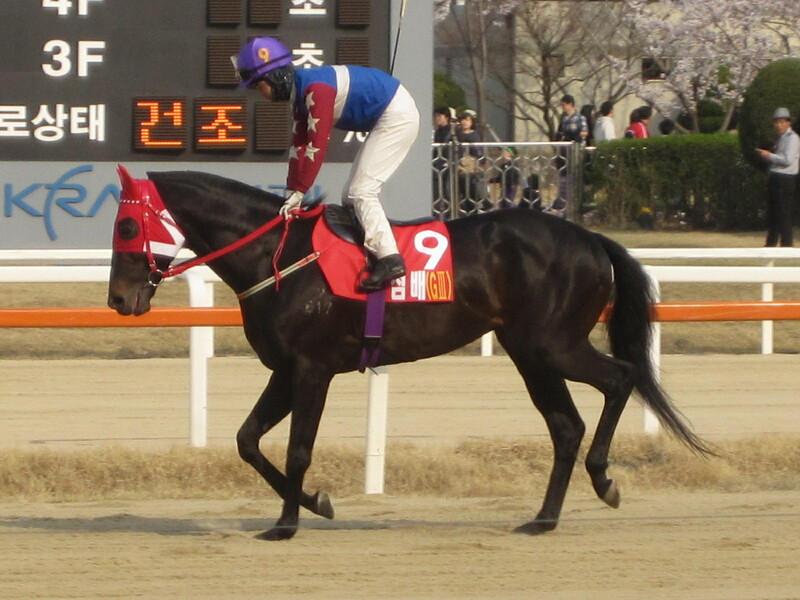 Outsider Choichoro, grabbing an unlikely third, was Seoul’s best finisher. Useung Touch first came to attention when finishing third in the Breeders’ Cup at Seoul last November after starting the race as a 90/1 outsider. On the strength of that run she, along with the two colts who beat her that day, Sun Hero and Sun Blaze (both also by Menifee) went into April’s KRA Cup Classic – the first leg of the Korean Triple Crown – heavily fancied. They all disappointed. The following month, however, Useung Touch headed to Seoul and the Korean Derby where she managed s superb second behind winner Gwangyajeil. With a class 2 win last month and now today, Useung Touch is already set to be crowned Korean bred filly of the year. It’s a second Stakes win and first Korean Classic for her sire Menifee with his first set of foals reaching Classic age. With the Derby won by a Vicar colt (Gwangyajeil) and the likes of Ecton Park, Forest Camp and later Officer, to come on-line, we are seeing a changing of the guard in the stallion ranks that have for so long been dominated by the likes of Didyme, Revere and Creek Cat. After the Korean Oaks was over with there was more Featured (although non-Stakes) action to come, in the shape of the Gold Coast Turf Club Trophy. Going into the race, which was for class 2 fillies and mares, the exciting US import Empire World (Empire Maker) was hot favourite to add to her previous four victories from five starts. It was not to be, however, as the only Korean bred filly in the race, Dongbangmiin took a narrow half-length victory over Queen of Rain with Empire World back in fourth. In English, “Useung” means “Winning”. Useung Touch has now won five of her nine starts. She’ll almost certainly be back in Seoul for a rematch with Gwangyajeil in the Minister’s Cup – the final leg of the Triple Crown – in October. In this kind of form, there’s no reason why she can’t have the winning touch there too. He might have beaten some of the biggest names in Korean racing to win the Busan Metropolitan last month but Yeonseung Daero was brought crashing back down to Earth in the second of co-feature races at Busan this afternoon. 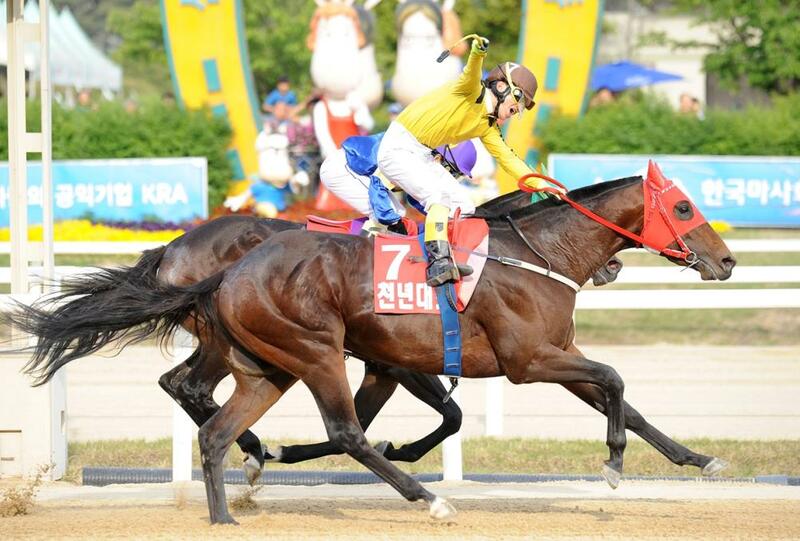 Having triumphed over Dongbanui Gangja, Tough Win and Dangdae Bulpae in the “Summer Grand Prix”, the five-year old Yeonseung Daero was sent off heavy favourite to win the nine-furlong handicap. However, it was US five-year old Nuri Choegang [Awesome Of Course-Jamie Love] who made all from gate to wire to claim victory with Yeonseung Daero trailing all the way and failing to make any in-roads into his lead in the final furlong, eventually going down by a length and a half. To avoid the heavy weights he would be required to carry in Korean-bred only handicaps, Yeonseung Daero is always entered in Open races where he consistently faces tougher opposition resulting in him having a record of “just” 15 wins from 35 starts. Nevertheless, with a two-kilo weight advantage, few expected him to be beaten by Nuri Choegang, a horse recording his 9th career win. Nuri Choegang completed a treble of winners for jockey Jo Sung Gon who made a small dent into Toshio Uchida’s lead at the top of the Jockey Championship – Mr. Pink himself scoring a double (Akane Yamamoto was also among the winners meaning Japanese jockeys accounted for three races on the day). Jo took out both co-feature races by winning race 9 on four year-old grey Gyeongkwaehanjilju [Tapit-Cozzie Maxine]. The colt, trained by Australian Peter Wolsley was winning for the seventh time in his thirteen race career and for the first time at class 1. For trainer Wolsley, it was the 110th winner of his time in Korea. Busan Race Park: 6 races from 12:30 to 17:10 including the Korean Oaks at 16:15 and the Gold Circle Turf Club Trophy at 17:10.